Drilling for coffee? 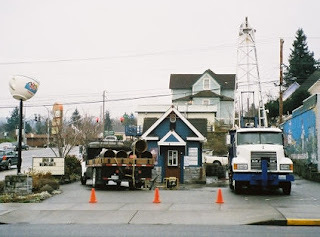 Image shows drilling rig set up at drive-through coffee place. Is it local production of that "brown liquid" from the ground? "Buy local, mine it local?" No. I think it is drilling to explore firmness of underlying rock. A six story condominium building is planned for that lot. That's the corner of State and Magnolia. Then there's the next block south. That's the block where two parcels sit side by side along State Street. At State and Holly, a new bank is proposed. The Key Bank that sits there now would be replaced with a newer version of Key Bank. Some people fear that the bank plans would not be tall enough for that location. They say that downtown Bellingham needs a more dramatic "first impression" as one comes down Holly Street, but just next door, there is another story. That's the proposed Bay View Tower. 23 floors of mostly condominiums, give or take a few stories. To be Bellingham's tallest building, but there are people who fear that it would be too tall. "Not tall enough" and "too tall," just with-in the same block. I guess one can never please everyone. Some people would like to impose height limits in downtown Bellingham. On the other hand, I like the diverse architecture that one sees in places like downtown Seattle or Vancouver, BC, where tall buildings can sit next to small structures and mini parks. It gives a city that exciting and diverse look. As an observer, I don't mind seeing some of the many changes happening around me. Population growth and prosperity are underlying issues that could be questioned on the global scale, but the architectural fruits of growth - the urban landscape - provides an interesting drama. I enjoy watching things unfold. When I was a kid, my dad used to keep tabs on all the construction projects around town. We lived in the college town of Pullman, Washington where major buildings were being added to the university campus. Pullman is home of Washington State University. Speaking of dramatic architecture, the corner of High and Holly Streets, in Bellingham, holds a new facility of note. It's part of Whatcom Educational Credit Union. That credit union is getting so big, it's like an empire. Ceiling kind of looks like an inverted pyramid. Interesting, and it's true, "education is big business." Big business, especially in towns like Pullman and Bellingham. With all these things going on, it looks like quite a few people have money. Money has never been a big goal of mine. My lifestyle of "living in one small room" remains intact however. One small room with a computer and a bicycle. Mainstream "professional and middle class America" lives differently than me, but my lifestyle seems to work okay right along side mainstream culture. People say my lifestyle is unusual. Unusual because I don't even drink coffee. Several years ago I read that Bellingham leads the nation in the number of drive-through coffee locations, per capita. The most coffee places for it's size. There must be a lot of coffee drinkers here, or more likely a lot of hopeful entrepreneurs. Merchants wanting to sell to coffee drinkers. Local businesses and also the chains. Just about everyone seems to be in the act. It's called aspirations. Coffee kiosks on so many street corners. Drinking, driving. Not the kind of bad drinking and driving that comes to mind, but still. It's people and their hurrying lifestyles. My aspirations are a bit different. I don't drink coffee, or drive an automobile, but chocolate milk, that's another story. Chocolate milk is an addiction as I bike. Here is something else to think about. The Key Bank plans some drive-through lanes as an important part of it's design. What happens if people actually do cut back on driving cars? If gasoline goes to, say $10 per gallon? Walking or biking past Bellingham's construction sites is entertaining. Interesting, but also a bit worrisome. Rent increases, related to prosperity, can push "non moneyed" people out of cities. I hope our city can succeed in respecting it's diversity of incomes and lifestyles as well as it's ever evolving diversity in architecture. At least for now, it looks like construction creates a lot of "available living space." Also I hear that some of the tall buildings may never get built. It's aspirations, but there is also the need for a foundation of financing and buyers. Like the many coffee places around town; there are a lot of "for rent" and "for lease" signs. That's kind of reassuring for renters, like me. Construction can create the "elbow room" needed for keeping life affordable as population and the economy keep growing. Someday, people still need to talk about lifestyles and population. Eventually that little house was removed, a fence put around the lot like big plans were brewing. Then (Autumn 08) the fence was removed and the little house put back. Bigger plans must have fallen in the credit crisis.